The idea that there was no soul or funk music recorded in Holland has already been proven nonsense on the CD Rare Dutch Groove, but I am surprised to discover new great records in this genre all the time. Like the Ronald Snijders LP Black straight music , that I got recently. I was actually after another LP that this Surinam soul brother recorded two years earlier, in 1978, Natural resources . It has been sold on eBay for more money than I can afford to spend, but that doesn’t keep me from hoping that I will find this LP one day on a flea market for 1 euro. Actually I would never pay so much money for an LP, I just want to hear it. LP’s like these are not available on CD. 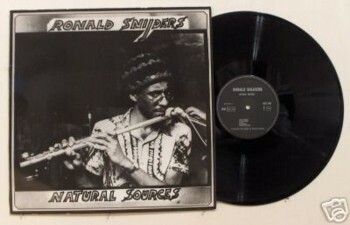 Ronald Snijders released the LP on his private label, and I have no idea what happened to the rights, the master tapes or with Ronald Snijders himself. (I will do a Google search after I finish this story.) The Natural resources LP has an almost mythical status among soul record collectors, which seemed a bit too much to me, based on some of Ronald Snijders’ later recordings that I did heard. His music is more jazz than soul or funk, and I am not a great fan of flute music anyway. Well, the discovery of the LP Black straight music changed my opinion: it may be more jazz than funk, but on some tracks he is very funky! And man, the way Ronald Snijders plays a flute is beyond category. There are only five songs on the LP, all instrumental and all very exciting. The whole band is from Surinam and they give some songs a real jungle vibe, with weird sound effects and great percussion. I have never heard a “Dutch” LP like this. It makes me even more curious to know what is on Natural resources . Is that better than what is on this LP?! Oh boy! Here is one of the best songs on Black straight music , Be funky .